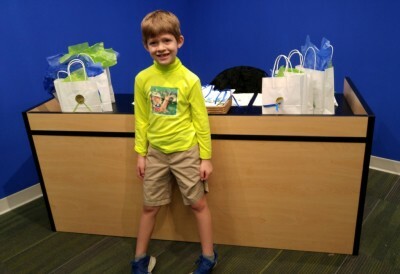 Wearing a "Sammy & Grammy" turtleneck, Grammy's grandson distributed the prizes to the winners of "The Sammy and Grammy in Downtown Savannah Writing and Art Contests" at Hesse K-8 on Valentine's Day. 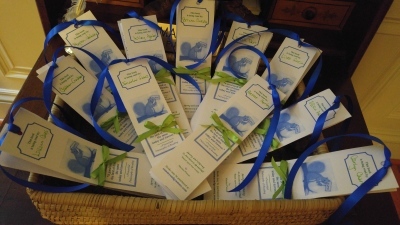 The winners of the 2 contests each received a copy of the book, autographed to him/her, a plush toy squirrel, and a personalized S&G bookmark with ribbon streamers in S&G colors. The 1st and 2nd runnerd-up, of each contest, each received a copy of the book, auto-graphed to him/her, and a personalized S&G bookmark with ribbon streamers in S&G colors. There were 6 students receiving "Honorable Mention" in the Writing Contest, and they each received a personalized "S&G" bookmark, with ribbon streamers in S&G colors, and a copy of their winning entry. There were 5 students receiving "Honorable Mention" in the Art Contest, and they each received a personalized "S&G" bookmark, with ribbon streamers in S&G colors, and a mounted copy of their winning entry (as did the winner and the 2 runners-up of the Art Contest). Each prize bag was decorated with a gold foil seal embossed with "Excellence." The entire presentation was recorded by the media specialist at Hesse and shown in each of the seven third grade classrooms the next morning. Many thanks to the eight outstanding judges who took time to participate in this contest! After having the story of Sammy and Grammy in Downtown Savannah read to them, by "Grammy," each third grader at Hesse K-8 was asked to write what was a "life lesson" he/she had learned from the story--and why that “life lesson” is important or could be helpful in his/her life. Sammy and Grammy in Downtown Savannah WRITING CONTEST! “A life lesson learned from the story Sammy and Grammy in Downtown Savannah is to be respectful and follow the golden rule. This life lesson is important because if you want people to be caring and respectful to you, then you will have to be respectful and caring to other people." After having the story of Sammy and Grammy in Downtown Savannah read to them, by "Grammy," each third grader at Hesse K-8 was asked to draw a picture of Sammy Squirrel doing something naughty, funny, or something else. Sammy and Grammy in Downtown Savannah ART CONTEST!